“I can’t believe we met you once, a year ago, and now you’re here,” Suzanna said. “Ha, yup.” I replied as we walked through the airport together. Can you spot the theme of our last month on the road? It was true. 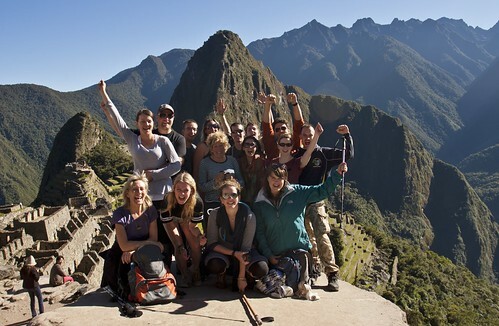 We met Suzanna and Simon on the Inca Trail in Peru on the first leg of our around-the-world trip. Our group about to descend to Machu Picchu. Simon and Suz are in the back row all the way to the left. When Suzanna and Simon came to visit New York this past summer, I caught Nellu describing our friendship weirdly to strangers: “We were on their honeymoon,” he told them. It’s true. We were. 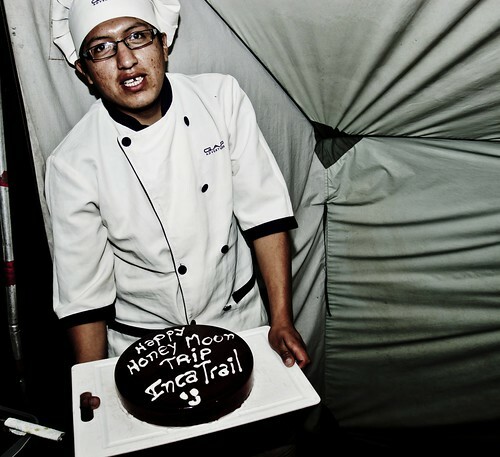 The cake the chef made for Simon & Suz on the Inca Trail for their honeymoon. Photo by Nellu Mazilu. Over the year since we met Simon and Suz, we bonded via Facebook over our shared experience, a love of travel, and an interest in photography and design. 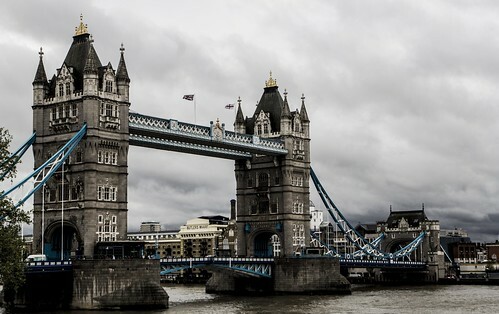 When we headed through London the first time for a long layover in last February, Suzanna casually suggested the next time we were in town, we should give her a shout. We, of course, did. I can best describe Suzanna and Simon as the type of people who are so good-natured and generous that they will offer to let two people they met in person once, a year ago, stay in their house AND THEN drive to the airport at 10pm on a school night to pick those people up. Those people of course were us. I’ve been in love with London for as long as I could remember. It was my first European city. The first two times I went, the weather was uncharacteristically wonderful. I spent two weeks there during my post-college month abroad. But it was funny going back with Nellu. He kept asking me where things were and if it was the same. We did the Tower of London and visited the Tate Modern. We saw Damien Hirst’s comprehensive exhibition. I know that critics have mixed remarks for Hirst and his commercialization of modern art but his show was my favorite of all the exhibits we had seen around the world. And it’s not just because of the diamonds. One of his pieces was a commentary on smoking entitled, “The Acquired Inability to Escape.” Brilliant. We walked back and forth over the bridges that cross the Thames to say we covered them all. Suzanna wanted to do a big night out while we were in town. So we met them, a few of their friends, and Suz’s brother Mirko at this great restaurant, Madison, for dinner and sunset views of St. Paul’s Cathedral. 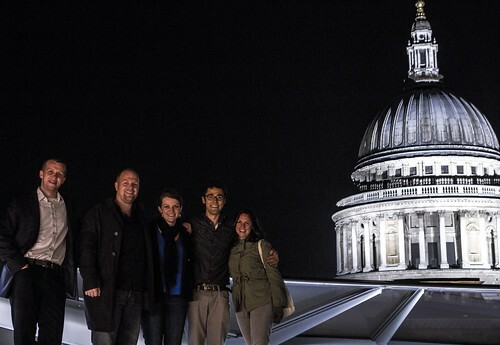 (L-R) Mirko, Simon, Suzanna, Nellu, me and St. Paul’s Cathedral. Photo by Nellu Mazilu. We then proceeded to go to a few more bars and then to a club. I can’t remember the last time I’d been to an untz untz club. I was feeling a little under-dressed in my traveler’s clothes but I didn’t let that get in the way of our hilarious button-popping night. The next morning, Simon knocked on our door inquiring whether we had any interest in brunch. “If you don’t mind, I would love to lay here and die for a little longer,” I said doing my best attempt at gracious, while not moving my head from the pillow. We had a moving day ahead of us. 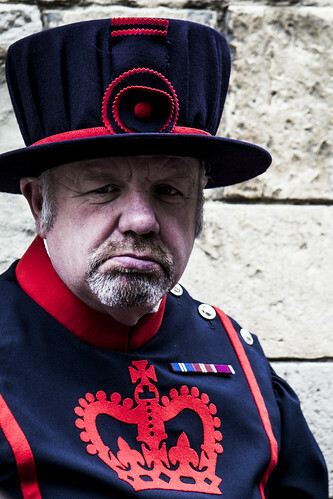 We wanted to spend a week in London but we didn’t want to over stay our welcome with friends. So we divided our time between Suzanna and Simon and our friends from home, Eric and Emma. Eric and I went to college together but we’re better friends from the years we all lived in New York right after school. He’s the type of friend that was always a witness to the shenanigans but could never be implicated in a court of law. Eric was one of the first to leave the city, taking a job in London way before everyone started to head for the suburbs. He met and married the lovely Emma a few years later and the two bought a house just outside of the city. In our last month on the road, I’m sure we looked like the vagabonds we were. And now, I would have to call Eric and ask him if he could meet us at the train station an hour later than we’d planned because the inexcusably, grown-up me was too hung over to get her act together. Eric didn’t flinch at our delay. A few hours later, we met Eric and Emma at the train station and they drove us to their home. We sat in the sun for a while in the backyard and talked. Nellu and I can be a runaway train of a conversation when we get started with travel stories but Eric and Emma didn’t seem to mind. Then Eric made us such a proper grown-up dinner: steak, rice and vegetables. I was so impressed and proud. Seeing college friends all grown up is an interesting study in psychological anthropology, especially when you’ve 1) missed out on transition from kid to adult and 2) you’ve put your own adultificaiton on hold to travel around the world for a year. But it was rewarding to reconnect. Since I had never gotten a chance to get to know Emma well, I relished the time we got to talk. And I don’t think I’ve ever had so much fun talking to someone. You may remember from a past post, I finally learned that our foreign friends, while speaking English excellently, didn’t understand me when I spoke too quickly. But Emma, as a native English speaker and city dweller, also spoke lightning-fast. Our conversation went at a breakneck speed. It was the talking equivalent of ping-pong game and we covered hours worth of material in minutes. 1) The English don’t all have bad teeth—Emma could be a tooth model—and they think it’s odd that Americans think they do. 2) Even though the U.K. has a national healthcare system, people don’t get yearly physicals or other types of preventative procedures. London was the first place that I started to remember what home was like. The city and its people are rushed, maybe even a little stressed. But it has an energy that I know I crave. And even though it rains a lot, I could live there in a heartbeat. 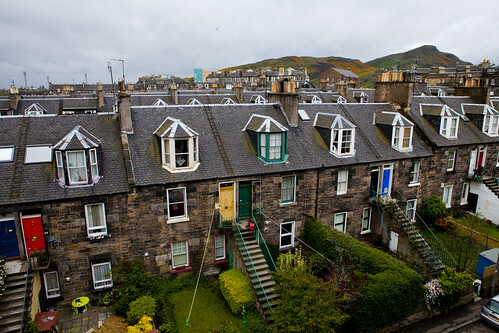 The view from our apartment in Edinburgh, Scotland. “I think Louise is pregnant,” Nellu declared, glancing at his computer. “Really?” I asked, rushing over to peer over his shoulder. Yup, Louise was pregnant alright, really pregnant. We also met Louise and her husband Craig on our hike to Machu Picchu. Nellu bonded with Craig over jokes unacceptable for some (most) audiences, quotes from Chappelle’s Show, and a slight obsession with the neon-yellow, bubble-gum flavored Inca Cola. Louise and I bonded over the fact that we’d essentially married the same man. Craig & Louise staying warm in our camp dining tent. 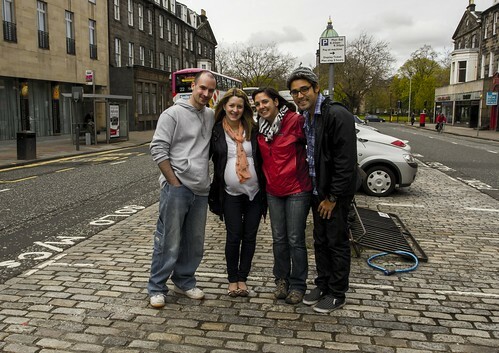 By the time we met up with them a year later in their hometown Edinburgh, Scotland, Louise was eight months pregnant. They’d tried to keep the news off Facebook but in the weeks before we arrived, a friend tagged Louise (and consequently, her belly) in several pictures. So in our minds, she went from not pregnant to super pregnant overnight. But the baby’s impeding arrival and some pretty hearty rain didn’t stop them from meeting up with us at Edinburgh Castle after Craig got out of work. It’s funny going to a place like Edinburgh Castle with friends. We teased them that they must have done it a thousand times but apparently they hadn’t been since high school. I tried to think of some of the places we’d take friends when they come to visit New York. The wind and rain whipped around us but our friends were troopers. Afterwards, we went to a bar down the street where they introduced us to haggis. 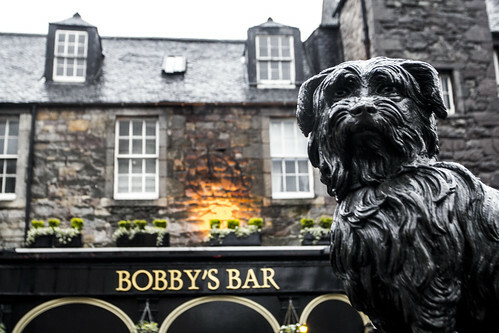 Bobby’s Bar has a back story of its own but it’s also the first place Nellu tried haggis. Photo by Nellu. Did I try it? Hell no. I only added normal people food like red meat and watermelon back onto my menu. There was no chance that I would try what Wikipedia describes as ” a savoury pudding containing sheep’s pluck (heart, liver and lungs); minced with onion, oatmeal, suet, spices, and salt, mixed with stock, and traditionally encased in the animal’s stomach and simmered for approximately three hours.” But of course, Nellu was dying to try it. Which brings me to a very serious discrepancy between our cultures—pudding. Pudding in the U.K. and Ireland isn’t pudding…well at least not the Bill Cosby-endorsed J–E–L–L–O version most of us in the States grew up asking for. Pudding on this side of the ocean, according to our friends, is a mixture of food that is often encased (sometimes in a sausage casing) and then cut up and served in cross sections. When our friend Suzanna ordered sticky toffee pudding at the restaurant in London, I thought to myself, “Um, your pudding looks like cake.” Sticky toffee pudding is one type of non-Jello pudding I can get behind. 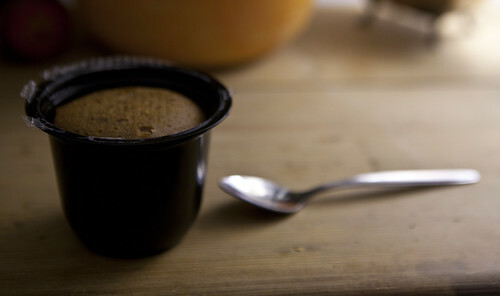 This picture of sticky toffee pudding was actually taken in Ireland. What I absolutely can NOT get behind is the Scottish black pudding aka blood pudding. It’s also called blood pudding because its made with blood. No joke. From Visit Scotland website: “…this mixture of congealed pigs’ blood, fat, oats, barley and a special blend of spices stuffed in a length of intestine, is popular at B & B’s up and down the country.” Yup. That would take me decades to get my mind around. But of course, Nellu wanted to try this as well. He got the chance at breakfast the next morning. Apparently, blood budding is often included in a traditional Scottish breakfast spread. Nellu’s reaction: “It’s not what I expected. But it’s good. It was a little dry.” Nellu tells me now, he thinks it’s like eggs—sometimes they make it runnier than other times. Cough, gag. Yup. That’s never going to happen. Louise gave birth to their son Daniel a few weeks later. He’s got his mom’s good looks and his dad’s sense of humor. We met Patrick and Nicola in Rio de Janeiro. Our hosts Lance and David at Casa Cool Beans threw a party teaching their guests how to make the Brazilian national cocktail, caipirinhas. I had gone downstairs to get something from our room. When I returned, Nellu introduced Patrick and Nicola. “They’re from Cork,” he said. “Really?” I replied, asking them, “Do you know Aoife?” Nellu had asked the same question just minutes earlier. Aoife is one of my closest girlfriends from college. After trying out a few cities, she settled with her husband, Barry, in Cork, Ireland. I had always gotten the impression that it was a small bucolic village but apparently it’s a sprawling city with a greater urban area population of nearly 200,000 people. So no, they didn’t know Aoife. But Nicola and Patrick were cool and we ended up hanging out with them quite a bit in Rio. They’re the type of people who are just fun. I always felt like we’d known them for much longer than we actually have. They were around our age, which is unusual among travelers. They were ending their extended-month, world adventure just as we were starting ours. After Rio, they would head home. 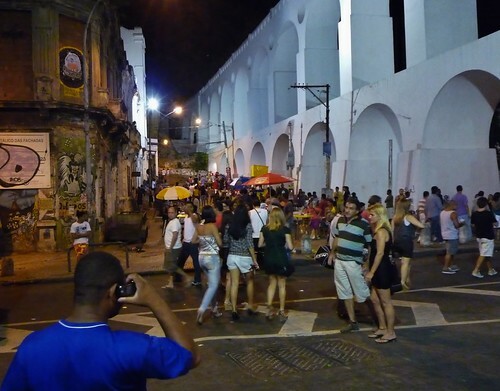 Nightlife begins to emerge under the Arcos da Lapa in Rio de Janeiro. Photo by Nellu Mazilu. 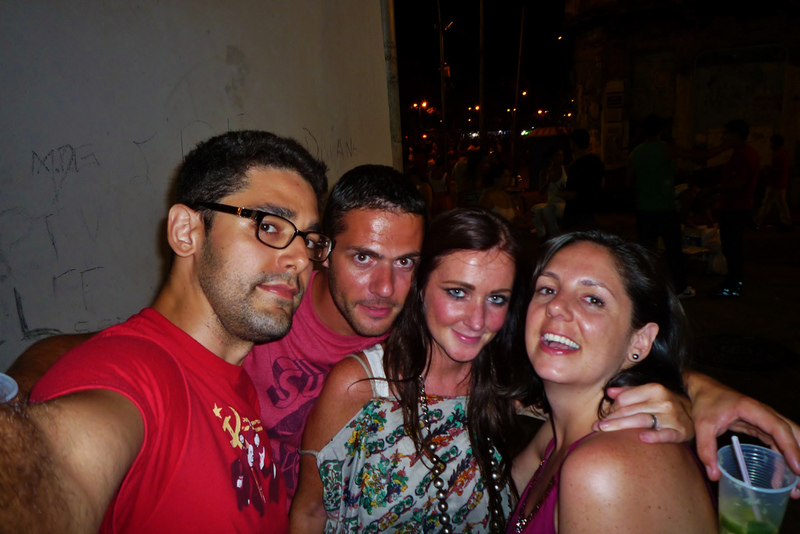 Nellu, Patrick, Nicola and me in Lapa. Spending our last week on the road visiting Nicole and Patrick and Aoife and Barry was the perfect way to end our trip. Old friends and new. Two worlds coming together. The symmetry. The symbolism. It was perfect. Aoife and Barry, meanwhile, had gotten married while we were in Japan. It was the first time I missed a close friend’s wedding. It was one of the few times on the road that I felt homesick. But I often missed my girlfriends. Aoife and I have some serious history together but because of the ocean between us, Nellu and I had never actually met Barry in person. Over the week we were there, we got to know Barry and his accent pretty well. Despite being relative strangers, he graciously welcomed us into his home with his pregnant wife. Barry and Aoife. Photo by Nellu. Aoife and Barry also introduced us to Eurovision, a bizarrely awesome song competition between the member countries of the European Broadcasting Union. It’s like American Idol (without the American part) for the European Union. (I recognize that American Idol began as Pop Idol in the U.K.) Countries like the U.K., Germany, France, Spain, and Italy get a free ride to the finals because they pay for it. There is some tremendously bad singing, costumes and stunts even in the final round. Entrants perform the same song through each round of the competition, which means you’ll have the really awful ones memorized by the end. And apparently everyone in Europe watches it. Baku, Azerbaijan hosted this particularly year and the programming featured plenty of tourism promotional spots proclaiming, “Azerbaijan: Land of the sun!” and land of a few more elements. The winner of Eurovision 2012, however, was Loreen from Sweden. Warning! This song will get stuck in your head, causing you to buy the track on iTunes. It’s there. I own it. Seriously America, we need to get in on this. We picked up right where we left off with Nicola and Patrick, staying up joking and drinking into the wee hours of the morning, again. We ended up crashing at their place a couple of times during our stay in Cork. It worked out great because I don’t think Aoife knew quite what do with us. And there’s just something to be said about travel friends. They understand this weird, awesome, intense, life-changing adventure in ways even your close friends just can’t. Nicola was also the only person we met who loves little Jimmy McMillan as much as Nellu and I do. Nicola and Patrick had been home for just about a year and they were still getting settled back into their old lives and working on their next steps. I am sure our visits with them helped our transition back home a lot more than we realized. I had started to reboot our old lives when we were in Cork. When I tried to add money to my pre-paid cellphone account, I discovered, not only was the account disabled, but they gave my number away. 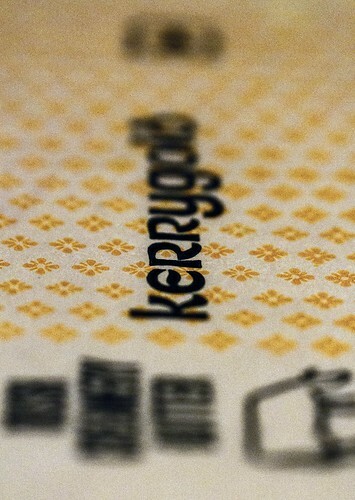 This was my first cellphone number. A 917 number. Did they even give those out anymore!? I had it for more than a decade. It got me through my early days in New York and my the beginnings of my relationship with Nellu. How could they just give it away? I called my old number and some guy picked up. I wanted to scream, “Give me my number back!” But that would have probably ruined his day too. I just said, “Sorry, wrong number,” hung up, and had a productive little cry. Our old lives were gone, our new lives were unknown. It’s a good thing it was sunny out and we had good friends. 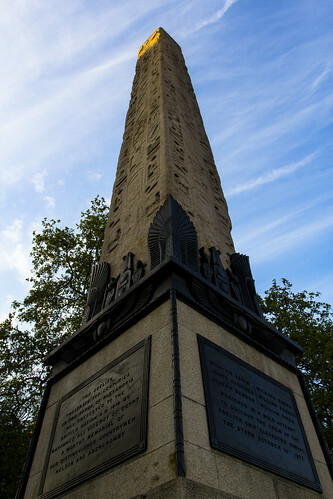 We did do some sightseeing between the pub crawling in Cork. Barry and Aoife took us on a driving tour of the nearby countryside. 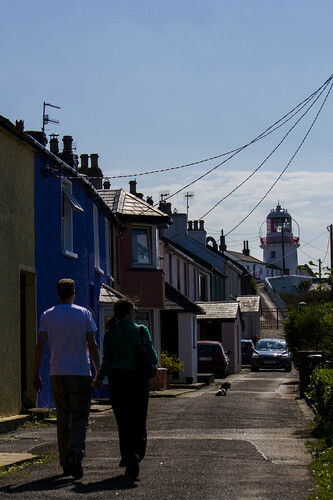 We also rented a car and headed down to the southern coast of Ireland to towns like Kinsale. 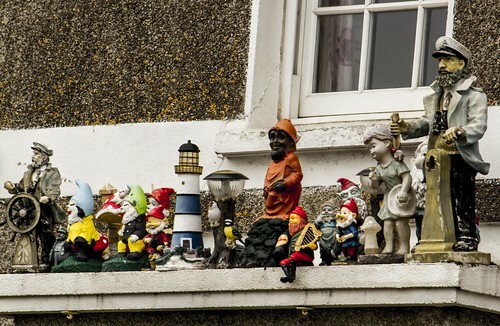 A ledge in Kinsale. Photo by Nellu. And we drove partially around the Ring of Kerry, which is breathtakingly beautiful. The need to finish it is just one more reason to go back. 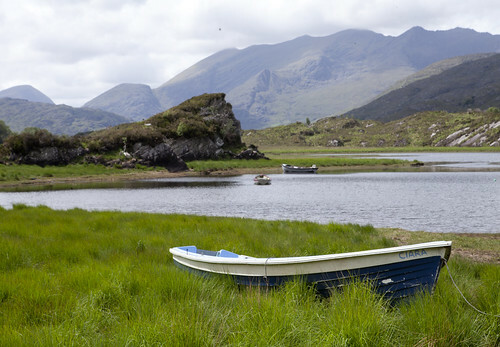 A vantage point on the lake on the Ring of Kerry. On our last full day in town, we swung by the Cork Butter Museum. Why? Well, its kind of a long story. Nellu had gotten a little obsessed with the idea of doing kitchy things. I don’t remember where the trend originated but it was definitely a prevalent theme during our last month or so on the road. (He tells me now that our whole trip was kitchy.) What’s more kitschy than the butter museum? And we learned the story behind Ireland’s most important food export. Butter is an Irish institution. Photo by Nellu. In the next 48 hours, we’d get on bus to a plane to a shuttle to a hotel to a shuttle to a plane to JFK, where my parents would pick us up for the short ride home to Connecticut. But at that moment, we stood in a museum in Cork contemplating the existence of bog butter. I was ready to come home when we it came time to come home. Nellu, I think, would have stayed on the road forever if we weren’t running out of money. Toward the end, he kept trying to get me to push back our flight dates and succeeded once. “You know, we have go home eventually,” I would tell him. This will be my last post on our adventures from the road. (Although, Nellu has promised a piece of his best pictures from the über kitschy Miniature Wunderland Hamburg.) I’ll keep writing updates on our off-track life, and there a few lessons I’ve learned worth sharing, but it’s time to bring our trip to a close. I hope that by writing this post and closing the book on this adventure, I will make room for a new one. I’ve held on a little too tightly because it’s been a dream. Everyone who has been a part of our adventure, even offering your moral support, thank you for the ride of my life. Hi there – Thanks for clicking on our blog. I’ve gone through to check on the pictures. There are a few missing (we will replace) but for the most they are loading. We’ll get the missing ones back online asap. Hope this helps.